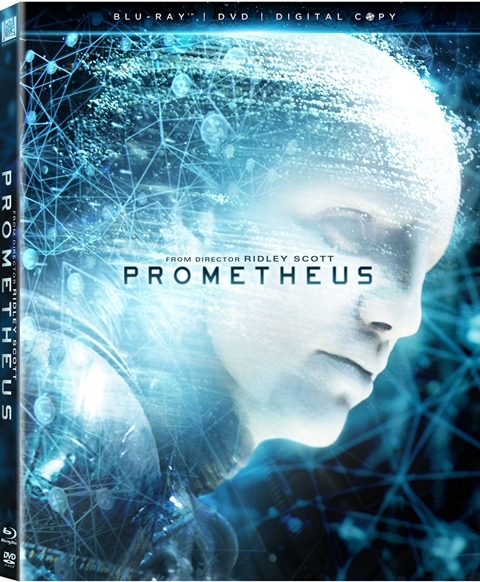 CHICAGO – I love the ambition of “Prometheus” and think that it’s one of the most technically accomplished films of not just this year but the last several (which makes it a strong fit visually for Blu-ray) but the script has some undeniable, inarguable problems that are only amplified when one watches deleted scenes that make clear how much of the film was being comprised on the fly. It’s a Blu-ray for which the commercials have advertised all the answers would be provided. In some senses, that’s true but not in the way the studio intends. “Prometheus” is undeniably a visual marvel. It looks absolutely amazing and the Fox HD transfer deftly conveys the film’s gorgeous look. It should be strongly considered for all technical awards at the end of the year. But the nagging sensation that those technical achievements are only in the service of a misguided story is amplified by the highly anticipated deleted and alternate scenes. Do you remember how director’s cut versions of “Alien,” “Blade Runner,” and “Kingdom of Heaven” made those Ridley Scott films significantly better? There was hope something similar would happen here but it’s clear now that this will never be the case. Don’t get me wrong. There’s some interesting material in the deleted scenes and I suggest listening to the commentary that accompanies them but there’s also a shocking sense of the lack of continuity during production. There’s a scene shot in which scientists find a shed skin of some creature. What creature? Who knows? They shot it without any background. There’s another in which the ship feels tremors. From what? Oh, that’s right. They spent millions to shoot the scene before realizing it didn’t really make sense to the plot. It’s amazing to me how much these scenes convey the lack of cohesiveness in the project before it hit the editing bay. As for my feelings on the overall film, check out my theatrical review. On second viewing, which I hoped would really amplify what I liked about the movie, I feel even more confident that this is not the movie it could have been with a tighter screenwriting and production process, one in which they weren’t just shooting scenes in case they fit the story they had yet to fully figure out, even if it looks so good that you may not care. Legendary director Ridley Scott (Alien, Blade Runner) returns to his sci-fi origins in this epic adventure bursting with spectacular action and mind-blowing visual effects. A team of scientists and explorers travels to the darkest corners of the universe searching for the origins of human life. Instead they find a dark, twisted world that hides a terrifying threat capable of destroying them… and all mankind! “Prometheus” stars Noomi Rapace, Logan Marshall-Green, Charlize Theron, Guy Pearce, Sean Harris, Rafe Spall, and Michael Fassbender. It was directed by Ridley Scott.